The internet is full of wild, over the top food creations, each one trying to outdo the others in terms of flavor combinations, toppings, colors, or size. Most of the time, when I see them on Instagram or other sites, I scroll on by, shrugging as I go, sometimes amused but otherwise uninterested. But let me be real clear, that is NOT what happened when I read about a croissant butter soft serve at Supermoon Bakehouse in the Lower East Side. My eyes widened, my mouth watered, and I immediately checked which train would get me there fastest as soon as I left work that day. Doin’ it for the Gram… and for my insane sweet tooth. I looove soft serve ice cream, and last week when New York was hotter than Satan’s armpit, I would’ve been happy to eat it for every meal. I also love a good plain buttery croissant, which is what really got my attention here. Sure almond is great and chocolate is obviously in a league of its own but a classic croissant with it’s soft middle and buttery, flaky outside is just the best. So a dessert that combined both? C’mon. I HAD TO. I’ve hated summer my whole life, dreading its arrival each year and distrusting everything about it, but over the last couple of years, be it cause I’m getting older and wiser or just having better summers, I’ve started to change my tune. While I still hate, hate, haaaate the heat, the rest of summer isn’t so bad anymore. I like the energy and vibrancy, the feeling of something fun always being just around the corner, the spontaneity in the air, the relief of a cold drink, impromptu picnics, last minute rooftop gatherings, new friends, new loves, new opportunities. I was walking down east Houston in the Lower East Side, mid conversation with a visiting friend, when we passed Russ & Daughters and a sign in the window that caught my eye: babka ice cream sandwiches! We were on our way to lunch somewhere else but just like that, something new had been thrown into the afternoon’s plans, and after a late lunch a few blocks away, we doubled back for dessert on the bench outside the iconic shop. Babka and ice cream are having a summer fling and I love it. A friend introduced me to babka a few years ago and I’ve been a fan of the traditionally jewish loaf-like cake ever since. Sometimes cinnamon, sometimes chocolate, I love the flavored ribbons swirled throughout, making it delicious and fun to pull apart and gobble. And ice cream? Well, ours is a life long love affair. Russ & Daughters not only used the babka, cut into circular pieces, as the top and bottom of this dessert sandwich, but also in the creamy, cinnamoney ice cream in between. 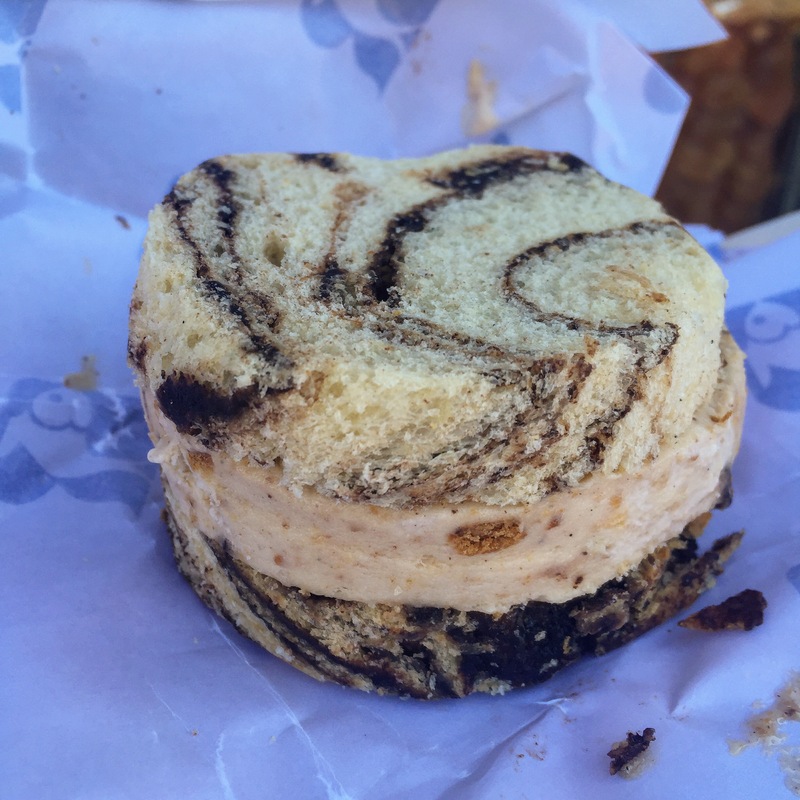 Wrapped up in the same wax paper used for smoked salmon or pickled herring, the babka ice cream sandwich had all the old school charm of this famed NYC institution and a fun, new take on a classic treat. Like so much of summer it seems, it was unexpected and sweet, a welcome break from the heat, and another fond memory stored away. I’m not sure how I’m ever supposed to eat burritos again, not after the absolute-perfection-in-burrito-form I had for lunch today. All other burritos will live in the shadow of the delicious one I had at Danny Bowien’s California style taqueria, Mission Cantina, in the Lower East Side, not far from his short-lived (but hopefully soon to be resurrected) Mission Chinese Food. Before bringing his restaurants to New York, Danny Bowien was a big deal in San Francisco, where phenomenal tacos and burritos are easy to find, and clearly he picked up a thing or two and brought it to the east coast, cause the burrito I had today was a 10 clear across the board. For starters, instead of being filled with tons of gut-filling rice, sad wilted lettuce and mushy tomatoes, this bad boy (easily shareable between two people if you don’t have a the bottomless pit of a stomach that I do) was stuffed, generously and evenly throughout, with carne asada, beans, guacamole, crema, queso blanco and salsa fresca. The carne asada, which I went with on the server’s recommendation (other choices were lamb, carnitas, fried skate, veggie, chicken and al pastor) was oh-so-soft and juicy, tender and full of flavor. The guacamole lent a creamy freshness to balance the hearty, rich beans, and the cheese did what it always does, made everything better. It was a wonderfully messy, saucy affair with juices running down my hands and my cloth napkin working overtime, and I loved every minute of it. Even the chips are delicious! 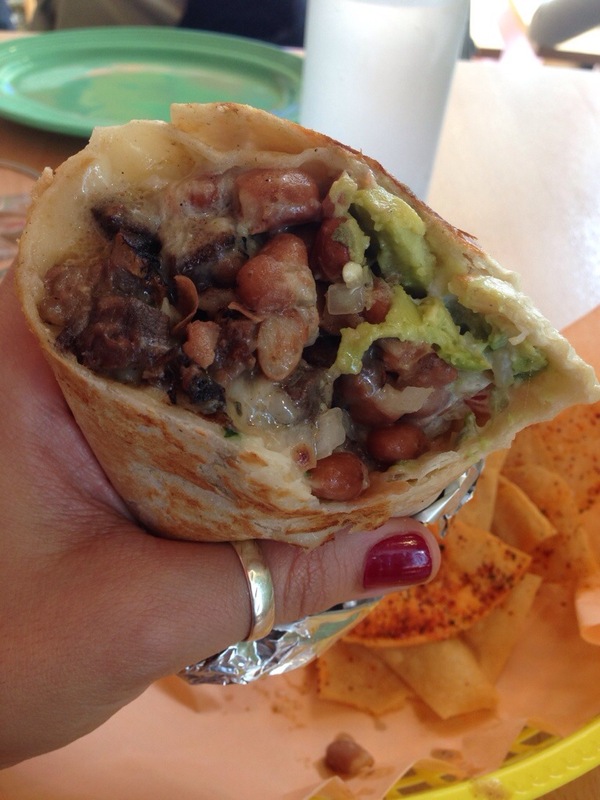 The tortilla— which let’s be honest, no one ever cares about— was more than just a vessel for burrito goodness. Tortillas are made in house, and it shows, because instead of being bland and rubbery, this one actually tasted like something you’d want to finish, or to use as a sponge for all of the burrito juice run off. 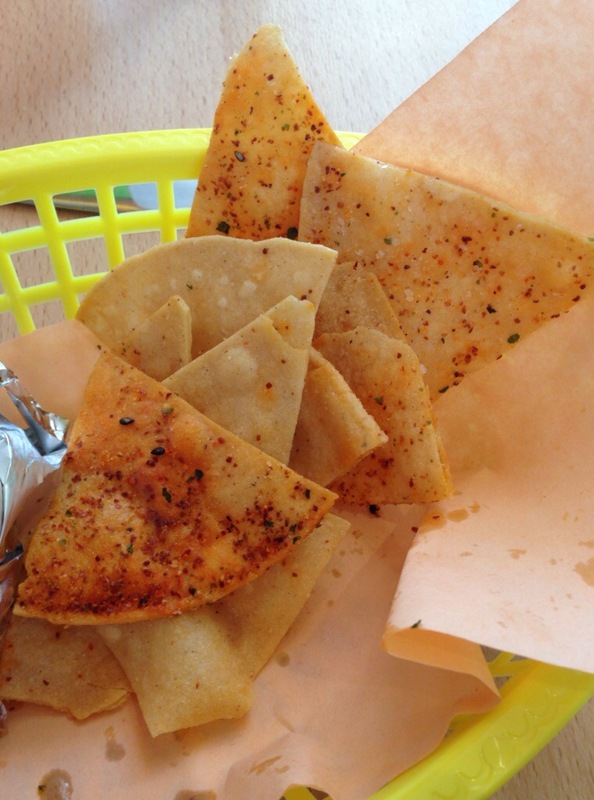 And to really push itself into the realm of greatness, the tortilla had a slight golden crisp to it, from where the burrito had been lightly seared for a perfect finish.The burrito alone was enough to make me an instant fan but Mission Cantina really sealed the deal with its accompanying tortilla chips. Usually an afterthought or distraction, these were anything but. Each one was thick and crunchy, fried in house and dusted in a punchy, colorful blend of spices that made it impossible not to each every last crumb of them. Two salsas, a tangy, avocado filled green sauce and a thicker, smoky red one were served with them, but almost not necessary because of how good they were on their own. 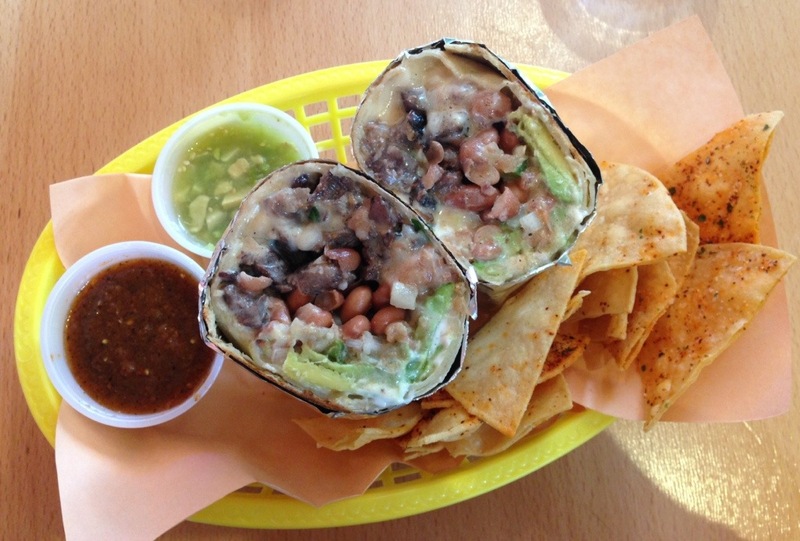 Burritos of New York, I’m not sure things will ever be the between us. 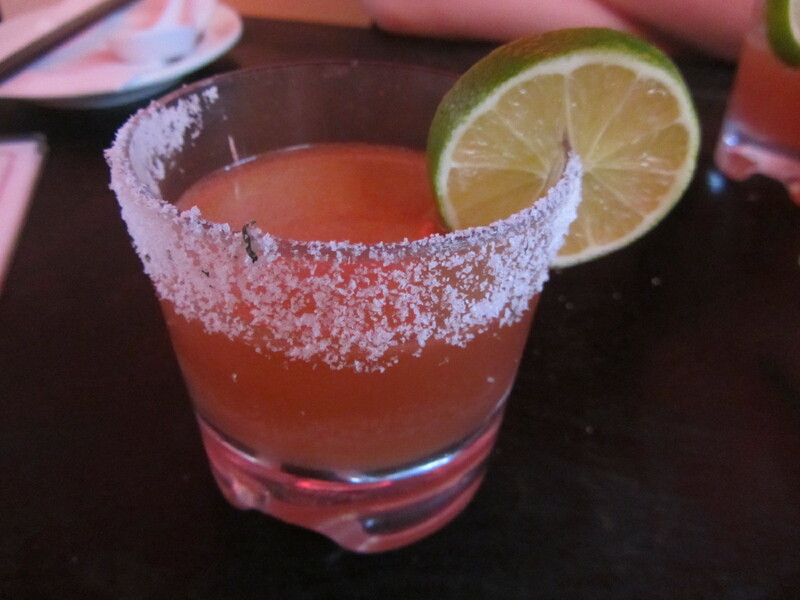 Mission Cantina, I’m all yours. As much as I love a big ol’, juicy, meaty burger (and you should I know I love it a lot), I’m also— and have been since way before this whole vegan challenge of mine— a big fan of veggie burgers. I don’t equate one with the other but love them both separately. Sometimes I want a good burger, and sometimes I just want a solid veggie burger. That’s just how it is. 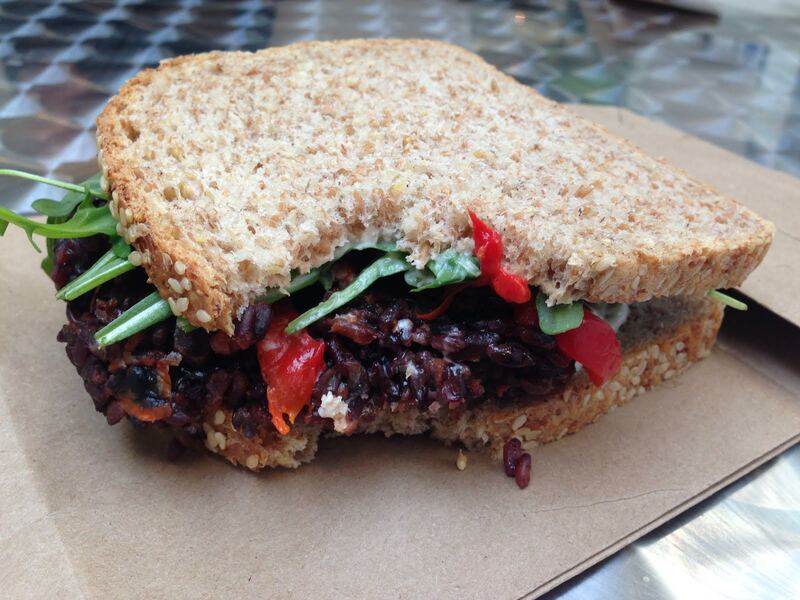 I’ve had some made from tofu, great ones out of black beans, and others with actual chopped up veggies, but never until a few days ago, when I had the forbidden rice burger at Ni Japanese Delicacies in the Essex Street Market, had I eaten one made out of rice. Ni is a small place, really a tiny, walk up counter of vegan and vegetarian Japanese inspired bites and drinks. 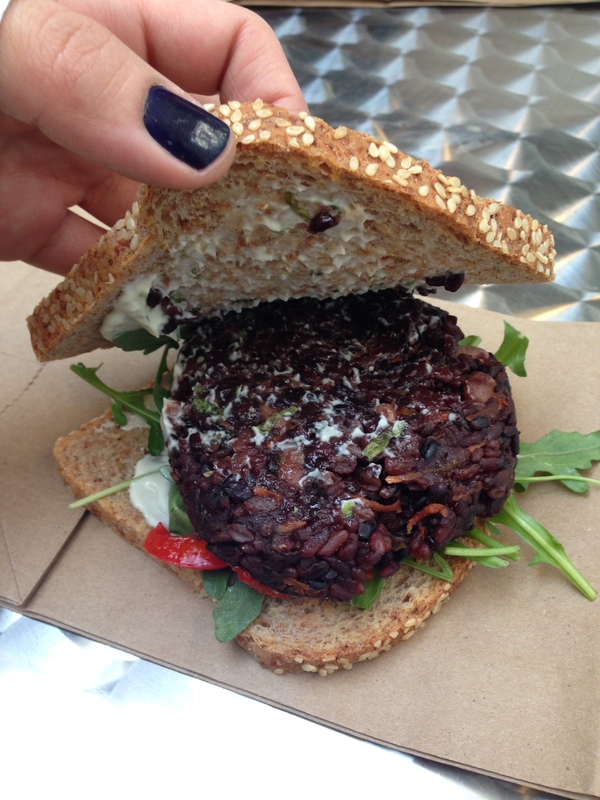 Their veggie burger, which usually comes on a brioche but can be replaced with vegan sprouted bread, has a “patty” of Asian black rice, maitake mushrooms, carrots, and kale and comes topped with baby arugula, pickled sweet peppers and vegan herb mayo. No meat here, fake or otherwise. This rice burger I’m sure without a doubt is better on the brioche, but even on the vegan-friendly sprouted bread, it was pretty good. The problem with a lot of veggie burgers is that they end up dry or crumbly, but Ni’s rice wasn’t either of those. 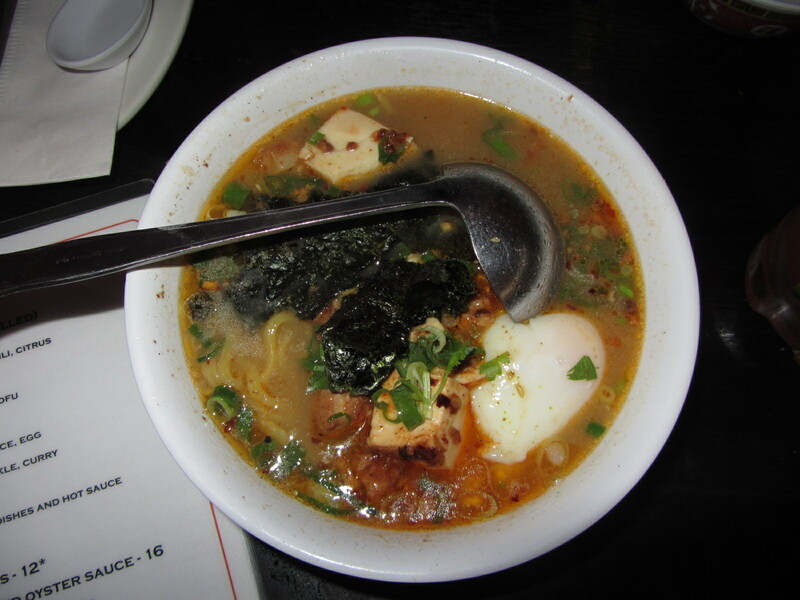 It was soft and just moist enough to not be a dry ball of rice, and had a good, earthy delicious flavor. The pickled sweet peppers and the baby arugula added a little variety in the way of texture and veggie flavors. All around meatless deliciousness, and something I’ll definitely be coming back to when I just want a veggie burger. If I could travel anywhere right now it would be to Thailand. It’s my dream destination these days, and part of it’s because I imagine gorging off delicious, cheap eats from street vendors and small, gritty food stalls. It would be hot, my hair frizzy and unruly, my skin shiny and sticky, but man, would that food be good. Recently I was at Pok Pok Phat Thai, Andy Ricker’s pad thai centric spin off of his more popular Pok Pok in Brooklyn, when I saw something on the menu that confirmed exactly what I imagine about my dream Thai vacation: Hoi thawt, a Thai specialty sold by street vendors at night markets. SOLD. In my wanderlust fueled reveries, I visit Thailand and eat stuff like this. And it’s damn near magical. 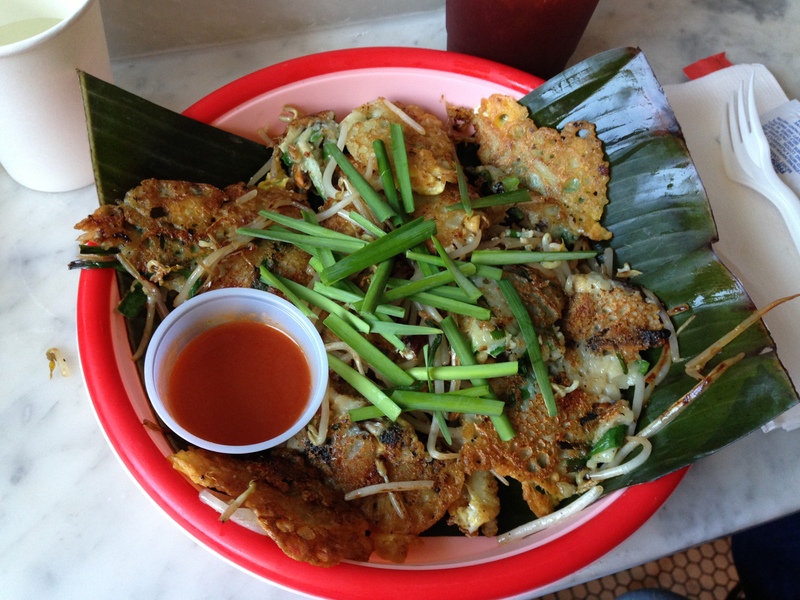 Served on a green banana leaf, hoi thawt’s an eggy creation made of crispy, thin egg crepe filled with plump little fresh mussels, chives, garlic and bean sprouts, served with a side of fiery, tangy Shark sriracha sauce. It filled my whole mouth with bright, colorful flavors and my head with even more delicious, exotic wanderlust fat kid daydreams. My Thai vacation dreams are alive and well and until I make them happen, thankfully at least some street eats are just a couple trains away. For Life’s Boo-Boos? I’ll take it. It’s been a quiet week or so here on the blog and it’ll probably continue to be that way for an indeterminate amount of time (though hopefully not too long) while I sort out some things going on in my personal life. 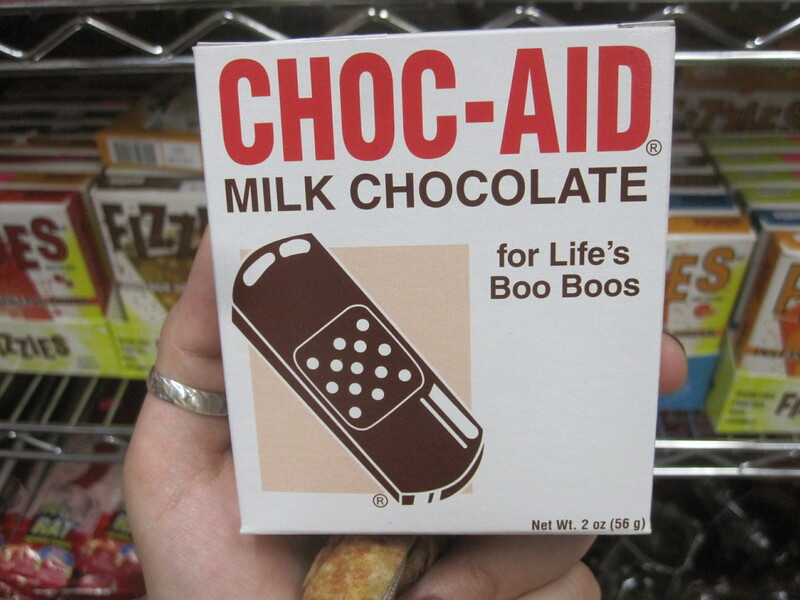 While I don’t think these chocolate band-aids I found at Economy Candy in the Lower East Side can fix what’s broken, I certainly don’t think they can hurt. They’re for life’s boo-boos after all, so maybe I’ll pick up a box or two, or twelve. In the meantime, if anyone needs me I’ll be listening to this song on repeat and eating chocolate band-aids and other nonsense for dinner while obsessively watching the Olympics alone. Cause really, that’s all I wanna do right now. That is, until the creative juices start flowing again and I can go back to regaling you all with my stories of gluttony. Until then, stand by.